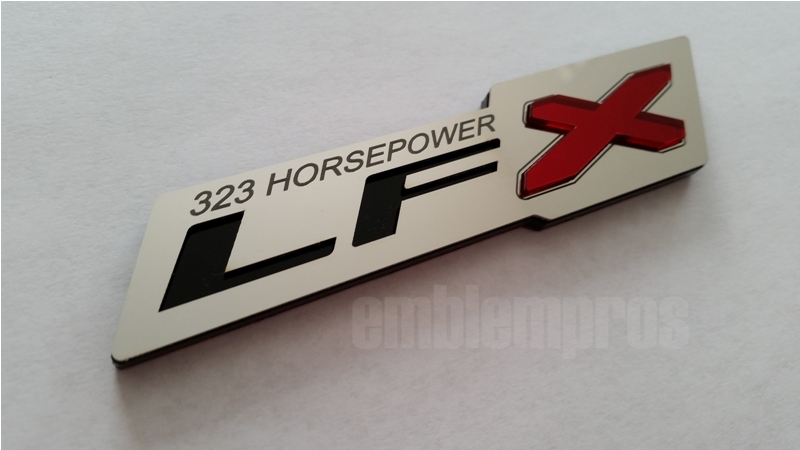 LFX 'ZR1' STYLE STAINLESS STEEL & ACRYLIC EMBLEM, for your Camaro. Made from premium mirror polished 304 Stainless Steel and UV rated Acrylic. 3M automotive emblem tape preapplied for easy installation. You have your choice of color for the "X" and custom etched text entry below. Size 1.2 x 5.4" apprx. Placement of the pieces is best on a mostly flat surface because they are not easily bent. It is possible to slightly pre-bend them a little, but curved surface placement must be considered carefully. These pieces can be placed on a SLIGHTLY curved surface only. *Includes 1 LFX "ZR1" style emblem. NOTE - The black small text in this picture above is only an example. What you type into the boxes below is what we will place on your emblem.